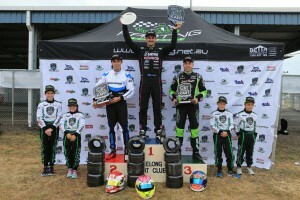 The Ricciardo Kart Junior team has finished the 2015 Australian Karting Championship on a high with international star Marijn Kremers powering to a podium result in Geelong over the weekend. After taking pole by over 0.6 seconds Kremers then won every heat without any problems. Unfortunately a problem off the start-line saw him fall back to third before recovering to second on the second lap. However the leader had already amassed a large gap and was just out of reach of Kremers who fell just short of the win in second. In the KA Junior final our newest member of the Ricciardo Kart Junior Team Jace Matthews absolutely flew home aboard his DR-AR28 Ricciardo Kart and despite starting from the back of the grid he push hard to finish fourth! Troy Loeskow showed plenty of speed across the weekend and produced the fastest lap in heat 1 and was always among the top-7 fastest drivers all weekend. Contact in the final after a mistake at turn 1 caused significant damage to the front end of his Ricciardo Kart which, after 27 laps of the 35 lap race forced him to retire. After a strong result in qualifying Brock Plumb couldn’t quite find the rhythm in the final and ultimately ended up with a DNF after a promising start. Lochie Hughes produced a great drive in the KF3 class despite being having no experience of the circuit and only one dry session all weekend. Contact in the final unfortunately held back on what a great weekend he was having as his speed was always inside the top-10 throughout the weekend. Fresh to the Ricciardo Kart Junior Team in the KA TaG category Rhys Astley started 24th on the grid and climbed an impressive 11 spots to finish the final in 13th. Contact caused Astley to retire from two heat races whilst inside the top-10 but despite this it was a fantastic effort for his first time at the Geelong circuit.